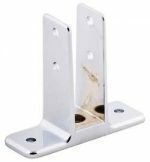 Centar Industries has dozens of brackets and Urinal Screen Brackets for bathroom stalls/toilet partitions including 1″ Urinal Screen Brackets, 1-1/4″ Urinal Screen Brackets, 1 1/4″X6″ and 1″ X 12″. Centar has various Toilet Partition Parts for all your needs. Call for single or bulk orders and talk to a product expert today. Urinal screen bracket 1-1/4 x 6"
Urinal screen bracket 1" x 12"